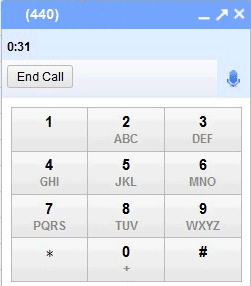 Right now, if you want to call someone using Google Voice, you need a phone. You can either visit Google Phone’s site on your computer, enter the phone number you want to call and wait until Google calls your phone and connects you for free or use Google Phone app on a mobile phone. The new feature will allow users to make voice calls over the Internet and it’s likely that it won’t be limited to Gmail. In April, TechCrunch reported that Google “built a Google Voice desktop application to make and receive calls” and that the application is tested internally. Google used technology from Gizmo5, a VoIP service acquired by Google last year. For now, Google Voice’s integration with Gmail is not publicly available.